B1642. 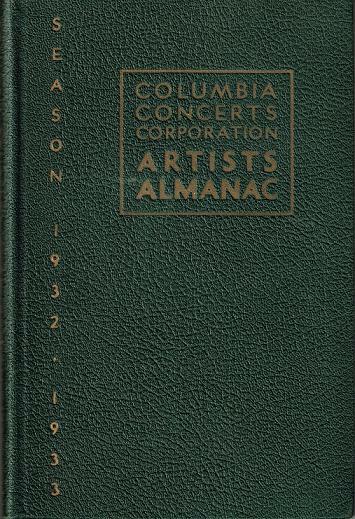 Columbia Concerts Corporation Artists Almanac, 1932-33, of Columbia Broadcasting System, featuring Metropolitan Musical Bureau, Arthur Judson Concert Management, Evans & Salter, Haensel & Jones, Wolfsohn Musical Bureau, Community Concert Service. Incl. Elaborate Profiles & Photos: Bori, Galli-Curci, Garden, Kurenko, Lehmann, Moore, Pons, Ponselle, Rethberg, Schumann, Anderson, Bampton, Onégin, Althoue, Dino Borgioli, Crooks, Edward Johnson, McCormack, Schipa, Tauber, Bonelli, de Luca, Robeson, Tibbett, Bauer, Gabrilowitsch, Horowitz, Novaës, Prokofiev, Elman, Heifetz, Menuhin, Milstein, Piatigorsky, Ricci, Spalding, Szigeti, and many, many more. 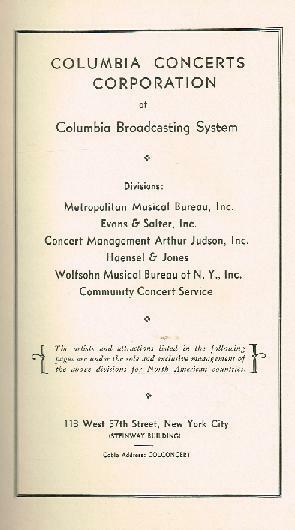 New York, Columbia Concerts, 1932. 211pp. Dark-green stiff boards, a remarkable copy for its age and derivation, under normal circumstances, this would have been a handy desk reference for concert managements to whom it was directed.